We offer the most personalized end of life services and cremation for your family pet. 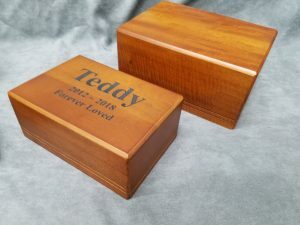 PRIVATE CREMATION – $195.00 per pet & includes Mahogany urn. Bring your pet directly to our facility when they have passed away or our staff can come and transport them (additional cost). Their cremation will begin immediately, It will be 100% private, only your pet in the crematory and in most cases you’ll be able to come back 2-3 hours later to pick the ashes up. We believe we have are the best pet crematory in the country. Its what you would want for yourself. Pets are treated like family and deserve an ethical cremation and ethical treatment along the way. We will arrange a veterinarian to come to your home and your pet will be peacefully put to rest. Your pet will be comfortable in their own bed, surrounded by their normal environment. This is available 7 days a week. As much advance notice is best, as emergency situations are hard to schedule. If you wish to perform the euthanasia at our location, we can arrange for this as well, with advance notice. How are we different than MN Pets? MN Pets uses a crematory in South St. Paul, that performs cremations in groups, and their clients pets ashes takes several days or a week or more to get ashes back. Being unregulated, many vets use terms like “separate” or “individual” cremation, however, if your vet uses VHA (Veterinary Hospital Association) crematory, then its not a private cremation, and you’re being misled and there are several other animals with your pet in the crematory, see for yourself here https://veterinaryha.org/services/cremation. Ask your vet if they use VHA Crematory, if they do, its not a private cremation. Since we operate our own crematories and only perform private cremation, our customers get ONLY their pets ashes back, and get them back within hours, not weeks. Don’t leave your pet at the clinic, where they’ll most likely be placed in a bag, frozen, and cremated with several other animals where it may be around two weeks turn around. We work directly with pet owners and a handful of compassionate veterinarians who believe in a human-like cremation for our family pets. Bring them directly to us when they have died and they will be 100% cremated alone, immediately, the ashes ready as early as a couple hours.